UK’s National Grid prepares for 100 per cent renewable energy by 2025.
for providers of new technologies. In July 2018, the government of Japan formulated the Strategic Energy Plan in order to show the public the basic direction of Japan’s energy policy. The Plan set the goal to raise Japan’s energy self-sufficiency rate from around 8 percent in 2016 to 24 percent in 2030. This looks unrealistic, but it’s not impossible if Japan can concentrate on the development and spread of renewable energy. However, the Strategic Energy Plan stays ambiguous about Japan’s future energy policy, despite its aim to shed light on that very subject. One big problem with the Plan is that the priority of the energy policy is not clear. The government aims to use renewable energy as the major power source by 2030, according to the Plan — but at the same time, the plan also attempts to restore nuclear energy and raise its share to 20 percent-30 percent. Former Prime Minister Koizumi Junichiro is well known for advocating the “zero nuclear energy” campaign after the 3.11 triple disaster. He continues to argue that Japan must be able to live without nuclear energy. In a recent talk show, he questioned the current Japanese government’s energy policy and said it was a lie to claim that nuclear energy is safe, low-cost, and clean. Some commentators criticize Japan for being poor at decisively changing track when necessary. When the time came for Japan to give up nuclear energy once and for all, the government was not ready to make a tough political decision. In the wake of the Fukushima nuclear accident, countries such as Germany declared they would abandon nuclear energy. However, it is ironic that Japan, the direct victim of the nuclear disaster, still doesn’t dare to say goodbye to nuclear energy completely. The Fukushima nuclear accident caused a crisis for Japan’s energy security. But it is this very crisis that could provide an opportunity for Japan to redirect its energy policy and accelerate the development of renewable energy. Despite the government’s hesitation, many Japanese already believe that nuclear energy is outdated and renewable energy is the correct direction for Japan. As recent TV programs have reported, some ordinary people are starting to invest in solar energy and sell electricity to power companies. Japan must build confidence that renewable energy has the potential to secure its energy supply. For example, it is said that during the golden week in May 2018, 93 percent of the electricity supply in the Kyushu area was from renewable energy. If Japan could get through the past eight years nearly without nuclear energy, then it must be able to do better in the future with the spread of renewable energy. Finally, to solve the energy problem, Japan also needs revolutionary innovation. For example, Toyota has just launched the new generation of its Mirai (Future) hydrogen fuel cell vehicle. The new Mirai not only has zero emissions, but also can produce and store electricity to provide energy in an emergency. The Toyota automobile is not only an energy consumer, but also an energy supplier. Mirai points to the future for Japan’s energy policy. Similar innovation should take place in other industries. MOLLY SAMUEL • MAR 4, 2019 Atlanta will move to 100 percent “clean energy” by 2035, according to a resolution passed Monday by Atlanta City Council. The goal is to have Atlanta use renewable energy, like wind and solar, and move away from power sources like coal, natural gas and nuclear. In the plan approved by City Council, both the city of Atlanta and all residences and businesses in it would achieve that goal by 2035. That’s a change from the original proposal that set a deadline of 2025 for city operations, and 2035 for everything and everyone else. The City Council had already voted unanimously to transition to what it calls clean energy, but Monday’s vote officially adopts the plan laying out how to do, and modifies those earlier dates. The resolution emphasizes finding ways to save energy and to make sure the switch is affordable. of the renewables trade associations. 2035 is within the immediate planning horizon. 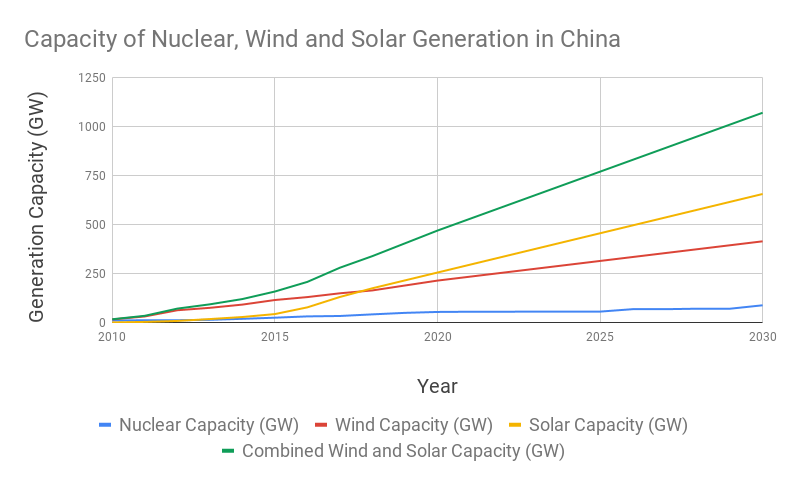 Wind & Solar In China Generating 2× Nuclear Today, Will Be 4× By 2030, Clean Technica, February 21st, 2019 by Michael Barnard, Close to five years ago I published an assessment of nuclear scaling vs wind and solar scaling using China as the proving ground in the CleanTechnica article “Wind Energy Beats Nuclear & Carbon Capture For Global Warming Mitigation.” Today, the China example is more clear proof that wind and solar are the better choice for global warming mitigation than nuclear generation.China’s example is meaningful because it disproves several arguments of those in favor of increased nuclear generation. It’s not suffering under regulatory burden. It’s mostly been using the same nuclear technologies over and over again, not innovating with every new plant. It doesn’t have the same issues with social license due to the nature of the governmental system. The government has a lot of money. The inhibitors to widespread deployment are much lower. Yet China has significantly slowed its nuclear generation rollout while accelerating its wind and solar rollout. Even strong industry insiders accept this, ones such as former World Nuclear Association executive Steve Kidd, writing in Nuclear Engineering International in 2017. Kidd estimates that China’s nuclear capacity will be around 100 gigawatts (GW) by 2030, well below previous expectations. Forecasts of 200 GW by 2030 were “not unusual only a few years ago,” he writes, but now seem “very wide of the mark.” And even the 100 GW estimate is stretching credulity ‒ nuclear capacity will be around 50 GW in 2020 and a doubling of that capacity by 2030 won’t happen if the current slow-down sets in. Why is China slowing its nuclear rollout so drastically? Because nuclear is turning out to be more expensive than expected, new nuclear designs are proving to be uneconomical, and new wind and solar are dirt cheap and much easier to build. Recently I published an assessment of the potential for wind and solar to massively exceed US CO2 reductions from nuclear in the CleanTechnica article US Could Achieve 3× As Much CO2 Savings With Renewables Instead Of Nuclear For Less Money. As usual, many of the comments from nuclear advocates related to the relative success of China, its speed of deployment compared to other jurisdictions and similar things. As I noted in 2014, the wind generation program had started much later than the nuclear program yet had been able to build much more capacity much more quickly, roughly six times more real wind energy capacity than nuclear per year over the years of 2010 through 2014. At the time, I used best of breed capacity factors for both wind and nuclear. One of the arguments against this at the time and on an ongoing basis is that China is curtailing wind and solar generation and achieving lower capacity factors. However, China is also experiencing less than best of breed capacity factors with its nuclear fleet, averaging 80% instead of 90%. This would have put the real world generation in the range of 3–4 times better for wind than for nuclear. It doesn’t really matter as even with the diminished capacity factors for wind and solar currently experienced, they generated more than double the electricity generated by nuclear in 2018. Wind and solar each generated more electricity last year than nuclear did. By 2030, the ratio is very likely to be 4:1 in favor of wind and solar. And as Lazard has shown, wind and solar are much, much cheaper than nuclear, so China will be getting a lot more electricity at a lower cost point. 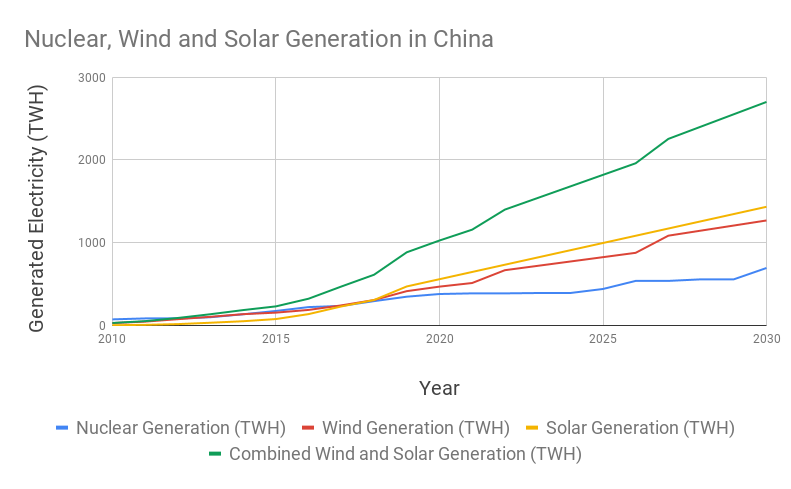 The chart above uses the capacity factors being experienced for wind, solar and nuclear to date in China and projects that all three will improve over the coming decade as operational efficiencies and grid connections improve…………. The quote from Kidd above suggests China might achieve only 100 GW of nuclear capacity by 2030. That’s an overestimation according to the actual data. Nuclear reactors in construction today only bring Chinese nuclear capacity to 55 GW by 2023. Reactors scheduled to start construction in the next three years only bring that number to 66 GW. Reactors planned but not scheduled at all are only likely to see 88 GW by 2030. There is no planned capacity that achieves even 100 GW, never mind the heady days when 200 GW was thought to be possible. And to be clear, even if 200 GW of nuclear had been realized, it still would have been less actual generation than wind and solar. Orsted’s Hornsea Project Spawns Talk of Offshore Wind Replacing Nuclear, Greentech Media, JASON DEIGN FEBRUARY 22, 2019 Danish developer Ørsted said its Hornsea One plant, which started delivering power to the grid this month, could help make up for a lack of planned nuclear generation in the U.K., as plans for new reactors have fallen by the wayside.When complete, Hornsea One will cover more than 157 square miles, making it bigger than the city of Denver, and have a peak capacity of 1.2 gigawatts, thanks to 174 turbines of at least 7 megawatts each. Given that the U.K. is relying on a largely untested reactor design for upcoming nuclear capacity, it is perhaps legitimate to ask if the reliability of new reactors will be significantly greater than those of gigawatt-scale offshore wind farms built at the same time. 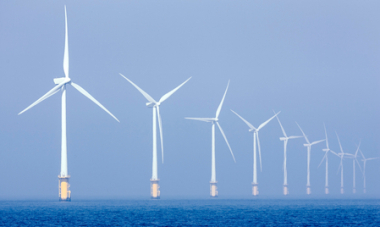 It is not just the U.K. where offshore wind could potentially take over new nuclear’s mantle. This month, in the wake of a partnership between Ørsted and Tokyo Electric Power Company, the analyst firm Wood Mackenzie Power & Renewables questioned whether offshore wind could also be a cure for rising energy demand as new nuclear languishes in Japan. The world’s largest offshore windfarm off the Yorkshire coast is to supply its first power to the UK electricity grid this week. Could it fill the gap left by a failing nuclear industry? When fully operational next year, Hornsea One will be the largest windfarm in the world. Its 174 Siemens 7MW turbines will generate enough electricity (1.2GW) to reportedly power more than one million homes. The electricity generated by the turbines 120km off of the Yorkshire coast will pass through one of three offshore substations, before being carried by three high voltage subsea cables (245kV). A clean and sustainable energy supply, and reducing the impacts of climate change has become priority for countries across the globe as part of the Paris Agreement. Climate change was also found, in the World Economic Forum’s global risks report, to be the biggest concern for business in 2019. The UK committed to reducing its greenhouse gas emissions by at least 80% by 2050, relative to 1990 levels, but the question remains just how can this be achieved? Last year renewable energy supplied a record 33% of the UK’s electricity, opposed to 19% from nuclear. As technology advances, renewable energy has become cheaper and the logical energy source. Hinkley C, the nuclear power plant in Somerset is years behind schedule, and billions over budget. Alongside Hinkley, there were five other plants with nuclear proposals: Moorside (Cumbria), Wylfa (Wales), Oldbury (West Midlands), Bradwell (Essex) and Sizewell (Suffolk). Three have been scrapped and two are yet to be approved. Of the eight sites currently generating power, the Nuclear Industry Association (NIA) report that only one is due to be in use by 2030……. The renewable sector is rapidly growing, its technology advancing and its costs decreasing, while nuclear remains an expensive and complex option that is becoming less appealing. Can renewable energy be created on the same scale as nuclear? As nuclear power plants shut down and reach their operational expiry date, their contributions to the UK’s energy mix becomes increasingly irrelevant. Chicago may be the largest city in the U.S. to commit to 100% renewable energy and has set a 2035 target date. The famous city’s long association with nuclear power says a lot about the future of clean energy Statesside. FEBRUARY 15, 2019 CHRISTIAN ROSELUND From pv magazine USA. Chase Tower is one of the tallest skyscrapers to dominate Chicago’s skyline. But it is not the building’s height, at 869 feet, which makes it prominent but rather what’s in it: the headquarters of Exelon, the largest owner and operator of nuclear power plants in the United States. However, despite there being 11 nuclear reactors in operation in the state of Illinois, Chicago is moving to a different power source: renewable energy. Yesterday, Chicago Mayor Rahm Emanuel unveiled the Resilient Chicago plan, which with action number 38 commits to “transition to 100% clean, renewable energy in buildings community-wide by 2035”. The deadline for all city government buildings to be powered solely by renewables, first established in 2017, has been brought forward to 2025. The language of the Resilient Chicago text says “clean, renewable energy”, and the Sierra Club does not include nuclear as part of its Ready to 100 campaign. The new policy is a particularly interesting move for Emanuel, once considered one of the more pro-nuclear politicians in the Democratic Party, and a man who brokered the deal that created Exelon. Were Chicago to include nuclear in a 2035 target, it would require either buying power from existing plants instead of investing in new generation, or starting new nuclear plants within six years. Given the high cost of nuclear compared to wind and solar, few decision makers are contemplating that option. The City of Chicago and stakeholders will have until December next year to come up with a plan to meet the city’s new mandate. And there are a number of other clean energy commitments among the 50 action points in the wide-ranging Resilient Chicago report. Chicago plans to complete the electrification of its bus fleet by 2040, and the city is also making a push for community solar. Action 37 states the city will “promote greater access to community solar”, by supporting the Illinois Power Agency’s community incentive programs and by incentivizing community solar through voluntary programs, with the Chicago Renewable Energy Challenge highlighted. Since the passage of the Future Energy Jobs Act in the Illinois General Assembly, Chicago has seen a boom in community solar, with 1.8 GW of projects applying for block grants in just the last two weeks, more than ten times the amount the state had planned for in its block grant program. Consumers, businesses and utilities all win with this new distributed clean utility because renewables plus efficiency and batteries is available as a very resilient, near-zero carbon solution to providing power when and where it’s needed at the lowest cost. As these technologies continue to scale, they continue to experience steep cost declines, making the idea of a nuclear alternative vanishingly unrealistic. Tens of billions of dollars have been spent developing different nuclear power plant designs, and even with enormous government subsidies and guarantees, corporations and utilities do not want to invest in nuclear power. Gates is a large investor in a nuclear firm, Terrapower, which hopes to build a prototype by 2030. If this target is achieved and a prototype is demonstrated by 2030, it could move toward commercial deployment in the 2030s. But we cannot afford to wait 15 or 20 years to scale very-low-carbon energy — and, fortunately, we don’t need to. Renewable energy has more than doubled in the last decade to provide 20 percent of U.S. electricity, as much as nuclear. Bill Gates’ quixotic quest to revive nuclear power https://www.greenbiz.com/article/bill-gates-quixotic-quest-revive-nuclear-power,Greg Kats, February 7, 2019 Bill Gates has been lobbying Congress to secure federal financial support for nuclear power and for a nuclear company in which he is a large investor. This plea for federal largesse from a decabillionaire illustrates why further nuclear subsidies make no sense. Nuclear power is already a heavily subsidized 60-year-old industry with over half a trillion dollars invested in several hundred large operating nuclear plants, including 99 in the United States. The cost of nuclear power has soared while the cost for other low-carbon power options — including wind, solar, batteries and energy efficiency — have plunged. This is why no U.S. utilities want to build nuclear plants unless they can get large additional subsidies. Gates’ rationale for nuclear power can be summarized as follows: Given the reality and gravity of climate change, nuclear provides the only large-scale, very-low-carbon electricity source that cost-effectively can provide power at scale when needed. Other very-low-carbon options, such as wind and solar power, batteries and energy efficiency, cannot reliably provide power when needed — especially on hot summer afternoons when air conditioning loads are large. looking more and more realistic as the price of renewable generation falls and the benefits of the flexible smart grid become more apparent. Filling the nuclear gap with renewables would indeed require an increase in rollout, but one that is well within UK capabilities. “With enough focus on smart low-carbon energy, there’s no reason why Britain shouldn’t achieve all its energy objectives despite the cancellation of these nuclear stations,” added Marshall. The ECIU analysis found that an additional 11.3GW of onshore wind, 5.7GW of offshore wind and 20.8GW of new solar capacity would be sufficient to fill the nuclear gap. Those figures are eminently achievable. Forget nuclear woes and increase offshore wind targets, says boss of leading utility, Owjonline 25 Jan 2019 by David Foxwell The chief executive of one of the UK’s leading utility companies has called on the government to increase targets for offshore wind energy after plans for another nuclear power station were put on hold.SSE chief executive Alistair Phillips-Davies said the UK should be grateful that in offshore wind it has an ‘off the shelf’ answer to the problem of how the country can decarbonise energy cost-effectively while securing jobs and growth for the UK economy. He is well-qualified to comment on energy policy in the country, having become chief executive of SSE in 2013 after working in the energy industry since 1997, when he joined Southern Electric. “Later this year our Beatrice offshore windfarm, the largest project in Scotland, will be completed, and will begin exporting low carbon electricity to the grid,” he said. “It is one of many projects delivered to time and budget, which have helped bring the costs down substantially. “Last year UK Energy Minister Claire Perry set out an ambition of an additional 1-2 GW of offshore wind per year during the 2020s taking the UK to a total of between 20 and 30 GW, meaning it could be the generation technology with the largest installed capacity in the UK. “The sector has responded, and an Offshore Wind Sector Deal will be finalised later this year setting out the industry’s substantial commitments to the UK’s industrial strategy. The question now is whether 30 GW by 2030 is ambitious enough,” Mr Phillips-Davies said. “In the coming months, the government will receive advice from the Committee on Climate Change on the implications of increasing its decarbonisation target from an 80% reduction in emissions by 2050 to net zero. Now that UK nuclear power plans are in tatters, it’s vital to double down on wind and solar, The Conversation, David Toke, Reader in Energy Policy, University of Aberdeen January 23, 2019 Now that Japanese giants Toshiba and Hitachi have walked away from UK nuclear power projects that had previously been abandoned by others, it has forced the government to reassess the pro-nuclear bias of its energy policy. Greg Clark, the UK business secretary, has recognised that nuclear power is no longer cost competitive with renewable energy, but don’t expect any extra push into the cheaper technology. There is easily enough solar and wind energy available to make up for the cancellation of the nuclear projects and to produce the low-carbon electricity required to make the UK’s 2030 carbon emissions targetsachievable. Instead, however, the country’s incentives and regulations favour developing more power plants driven by natural gas. Having hacked back emissions from power by over two-thirds since 1990, progress with decarbonising the grid risks coming to an end. According to the UK parliament’s Committee on Climate Change, the UK needs to cut power emissions from about 265g of carbon dioxide per kilowatt hour in 2017 to under 100g by 2030. The government had been substantially relying on nuclear power to do this, having originally identified eight sites as viable for new plants. Six projects were taken forward, including Hitachi and Toshiba plants in Wales and Cumbria respectively. Yet despite much larger government incentives than those available for renewables, most private nuclear builders are now steering clear, having seen the problems with new plants in the likes of the US and France. The only two projects still on the slate are a joint venture by EDF of France and CGN of China – both foreign state-owned companies. They are building the UK’s first new plant in over two decades, Hinkley C in south-west England; while also planning a second, Bradwell B, in the south east. Even before the latest announcement that Hitachi’s Wylfa plant in Wales was being suspended, the Committee on Climate Change was already saying the UK needed to build more renewable capacity to reach its carbon reduction targets. Now the problem is even worse. In 2018, 19% of the UK’s electricity was generated by nuclear plants. With most existing plants due to retire over the next few years, I calculate this may now fall to 10% by 2030 when you factor in the new-build cancellations. Solar and wind generation could easily more than make up for this. For years, renewables’ share of generation has been steadily rising. It reached 30% in 2018 and is due to reach 35% in 2020. But with no new incentives for onshore wind and solar and only limited incentives for offshore wind, it looks likely to fall far short of its potential……….. The reason why more renewables are not on the cards is because the Treasury is keen to limit energy incentives. It worries that the electricity price has been increasing – and hence the Treasury wants to strictly limit new incentives, the costs of which are added to electricity bills. This, however, ignores the fact that CFD prices will benefit from the falling cost of building offshore wind farms – the price has more than halved in three years. Nevertheless, the amount of money available to pay for the contracts is being limited to around half that being made available to owners of gas-fired power plants to supply capacity when the wind isn’t blowing. If all 27GW of offshore wind power schemes in various stages of planning got contracts, I calculate it would supply around one-third of the total electricity requirement. Coupled with the remaining nuclear power and the renewables that are already onstream, that would reach the 75% of power that the Committee on Climate Change reckons needs to be coming from these low-carbon sources by 2030 to achieve the emissions targets. This is not counting potential offshore wind resources which are not even being mobilised, plus large possibilities for onshore wind and solar. Instead, gas-fired power looks set to supply around half of UK electricity by 2030, compared to 40% at present. One government justification for being less generous to renewables is that unlike gas or nuclear, they do not represent “firm” power – in other words, they only generate when the wind is blowing or the sun is shining. Proponents of renewable energy counter that you can reduce the generating capacity required by increasing the use of batteries to store power on the grid and by incentivising consumers to, say, use more power overnight when demand is lower. Yet one other option that attracts less attention is that you also get spare “firm” capacity from small gas engines or open-cycle turbines. These can be built quickly and would only be sparingly needed in a system mostly supplied by renewables. Based on my calculations using Hinkley C and Wylfa, they cost around one-twentieth of the projected cost of new nuclear power. They are alsonearly half the price of large gas-fired “CCGT” plants. Instead, however, the government spends the lion’s share of its incentives pot on large conventional power plants, many of which would operate whether they were subsidised or not………. The European Commission said the subsidy scheme to be adopted for the project is in line with the EU state aid rules. The 40-year old Fessenheim nuclear plant has faced several safety issues over the decades. JANUARY 21, 2019 EMILIANO BELLINI The European Commission has given the green light to a tender mechanism the French government has conceived to enable the construction of solar plants with 300 MW of capacity at the Fessenheim nuclear power plant – the country’s oldest. The commission said the project selected through the tender will receive a premium tariff under a 20-year contract, and the tender’s budget is approximately €250 million. “The aid will be granted by the French state and will contribute to the French and European objectives of energy efficiency and energy production from renewable sources, in line with the EU’s environmental objectives, with possible distortions of competition state support being reduced to a minimum,” the commission stated. The tender was announced by the French government in April. In July, France’s Directorate General for Energy and Climate – part of the Ministry for the Ecological and Inclusive Transition – revealed details of the tendering scheme. According to that announcement, 200 MW of the tendered capacity will be for ground-mounted PV ranging in size from 500 kW up to 30 MW, with the remaining 100 MW accounted for by rooftop projects larger than 8 MW in scale. The tender was to be implemented in three phases, starting late last year and continuing in the middle and latter stages of this year, and was set to comprise three groups of installations: the ground-mounted PV; rooftop systems on buildings, greenhouses, carports or agricultural buildings with an output of 500 kW to 8 MW; and rooftops with a capacity of 100-500 kW. Projects selected among the first two categories will be entitled to a premium feed-in tariff while installations of the third and smallest category will have access to a regular FIT. The premium tariff for ground-mounted PV is expected to be €50-70/MWh, and that for larger rooftops €70-100/MWh. Smaller rooftop projects are expected to be granted €80-110/MWh. The 40-year-old Fessenheim nuclear site, in the Haut-Rhin department of Alsace in northeastern France, is set to be decommissioned by next year. The plant has seen more than one temporary shutdown due to safety issues. One of the most high-profile issues occurred in April 2014, when Reactor 1 was shuttered. The French Nuclear Safety Authority reported at the time that internal flooding in the non-nuclear part of the reactor had damaged safety electrical systems. After being repaired, the reactor was reconnected to the grid in May the same year. a zero carbon economy for the state. for the state by 2040.